And then there are those who buy their dog a house. Not a doghouse mind you, a whole HOUSE. Meet Whitney, a 31-year-old mortgage industry professional who lives in Falls Church, Va. Similar to many millennials, she is focused on her career, so for now, her 3-year-old dog, Lucy Goose, is her baby. And as with any good parent, it's important to Whitney that her baby be happy in their family home. "When my dog is happy, I'm happy," she confides. Whitney became a first-time homebuyer nine years ago when she was only 22 years old. She purchased a one-bedroom condo because it was cheaper than renting in the high-priced, Washington, D.C.-area where she was living. With her family's help, she bought a $165,000 condo using a 10 percent gift down payment ($16,500) and private mortgage insurance. Her monthly mortgage payment was $2,100 (yes, that was cheaper than the average rent! ), and she lived there for more than six years. One month before she sold her condo, Whitney adopted Lucy Goose from a shelter. Although only a puppy, it was obvious the Labrador/Great Dane mix wouldn't stay small for long. The single month Whitney and her energetic new puppy lived together in her small condo was challenging. Whitney knew she needed a larger place but wasn't sure exactly how much room she required. So she rented a townhouse - without a yard - in Arlington, Va., for $3,100 while she assessed the situation. It soon became apparent that a townhouse wouldn't work either, so she started house hunting. * Proximity to dog-friendly establishments, i.e., restaurants, dog parks, etc. It took Whitney one year to find a house that checked all her boxes. The house has four bedrooms and two-and-a-half bathrooms. It sits on a quarter acre, and has a large fenced-in yard and a doggy door for Lucy, who has since grown to be a 90-pound, gentle giant. The house also has a nature trail behind it. But her dream house came at a steep price: $600,000. Fortunately, investing in homeownership early in life paid off for Whitney. She had $40,000 in equity from the sale of her condo, and chose to make a low down payment of 5 percent ($30,000), using most of that equity. She was able to take out a high-balance conventional loan using private mortgage insurance to avoid having to put down 20 percent ($120,000). Her monthly mortgage payment is $3,800 - only $700 more than she was paying for the townhouse. They moved in last summer. And what does Lucy Goose think of her new house? "She is constantly happy," gushes Whitney. "She loves going in and out of her doggy door, and I've caught her sunbathing on the deck. I sacrifice a lot for Lucy, but she is my baby." Speaking of babies, Whitney is now engaged and while she and, her fiancé Eric have no immediate plans to start having children after they're married, it's nice to know they'll have room to grow their family. Then they can all sit, stay and be happy in their forever home. For more homebuyer resources, visit readynest.com. 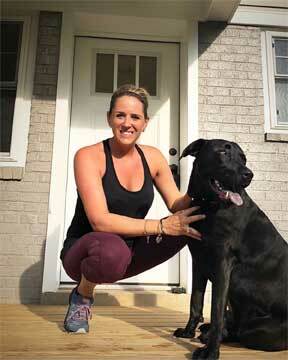 Whitney and her dog, Lucy Goose, pose in front of their new dog-friendly home on move-in day last summer.